While neither woman came out as a victor, did you notice that the fight was more than just two skilled fighters in Game of Thrones? Game of Thrones once again tried to top itself as Season 7 of HBO's fantasy epic continues its run of "best episodes ever." However, while "The Spoils of War" had one hell of a Stark reunion, we all remember the episode for one particular fight scene between two favorite characters. Forget Cleganebowl (for now), let's talk about the Wolf vs. the Giant. There is no doubt that #GwendolineChristie has a pretty sweet deal, because Brienne of Tarth sure gets all the best fight scenes. From Loras Tyrell to Jaime Lannister, and even The Hound, Brienne the Beauty remains undefeated in combat. So, when Arya Stark fancied her chances against Brienne, our two warrior women started their very own fight club in the chilly climes of the North. While neither woman came out as a victor, did you notice that the fight was more than just two skilled fighters? It actually charted Arya's entire journey across the Seven Kingdoms. We may have been too busy fangirling over the two favorites locking horns, but Joanna Robinson with Vanity Fair noticed that Brienne vs. Arya showed just how much the plucky Stark has learned over the past seven seasons. Arya may have said that "No One" taught her to fight like that — a subtle reference to Jaqen H'ghar perhaps — but we know that "no one" might also refer to the fact that it was no one person that tutored her. So, let's take a look at who has been mentoring our Lil Kill Bill. A quick-footed Arya twirled around the Winterfell yard as a cumbersome Brienne struggled to keep up. 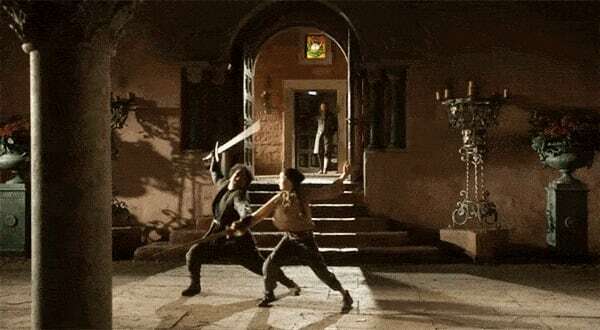 It was obviously Syrio Forel who taught Arya her nimble swordplay. While Syrio is one of he show's earlier casualties, he has had easily the biggest influence on the adult Arya with her fearless fighting spirit and "dancing" techniques. Also, did you notice that Arya was delighted at the end of the fight, just as Syrio was with her at King's Landing all those years ago? While it may seem odd to take influence from your rival house's patriarch, Tywin Lannister lives on from beyond the grave. The sharp military man taught Arya that you should always know your enemy, and perhaps if Tywin had been better at picking the whores that he beds, he wouldn't be languishing in the Seven Hells. Back at Winterfell, Arya dryly observed that Pod shouldn't be fighting someone like Brienne. Given the dubious honor of taking himself off Arya's infamous kill list, Sandor Clegane also helped Arya's journey to present day. The Hound may have mocked Arya's "dancing" style, but if you remember their sparring grudge match, we saw Arya foolishly try to poke through Clegane's armor. The Hound brutally slapped her down, and while Brienne didn't go that far, we saw Arya learn from her mistakes and aim for her fleshy bits that weren't protected by armor. Most notably though, Arya's trip to Braavos wasn't the lame duck of a side plot that we all thought it to be. Apart from going blind and taking a dagger to the gut, it looks like the young Stark actually learned some valuable lessons. Like some sort of Mortal Kombat move, a spinning Arya can be seen leaping from the floor when she is knocked down by Brienne. That wicked Waif may be just another face on the wall, but at least Arya's nemesis taught her something. While we have already seen Sansa Stark get her political prowess from the likes of Cersei, and Bran learn from the Three-Eyed Raven, Arya seems to be taking on the more redeeming qualities of those who she has crossed paths with. A child may have walked out of Winterfell in Season 1, but a fully evolved Arya walked back in during Season 7. As a hardened assassin and a legion of faceless possibilities at her disposal, Brienne probably isn't the only the one who will be crossing blades with the sassy Stark. As the show famously says, all men (or women) must die, but how many will be at the other end of Arya's Valyrian steel? Will Aquaman Be the Worlds of DC’s Black Panther?